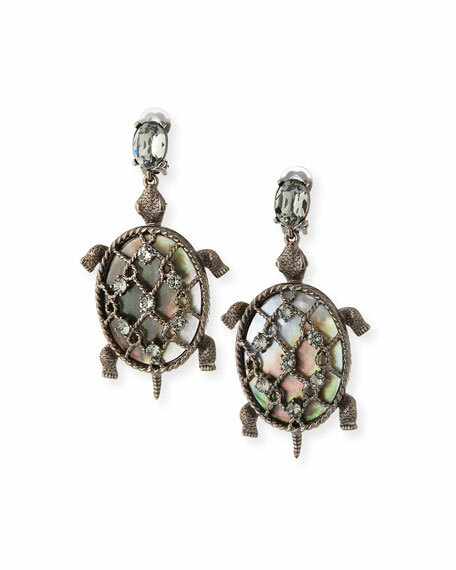 Oscar de la Renta shell turtle earrings. Swarovski® crystal posts and details. Turtle drop with twisted lattice shell. Alexis Bittar crystal pavé teardrop earrings. Gunmetal-tone plating over brass hardware. Square posts with teardrop dangles. Mixed pyrite and crystal accents. Post backs for pierced ears. Approx. 3.5"L.
Alexis Bittar retro clip-on earrings. Golden and rhodium-tone plating. Hand-sculpted, hand-painted Lucite®. Crystal with natural malachite doublets. Clear crystal accents detail stones. Approx. 2.8"L; 0.8"W. Clip-on backs. Made in USA. Ippolita earrings from the Wonderland Collection. Signature hand-hammered sterling silver hardware. Round clear quartz doublets with blue backing. Mother-of-pearl open and round disc drops. French wire for pierced ears. Approx. 2.9"L; 1.4"W. Imported.